I drove to Brigham and Women’s hospital early this morning to visit my dad who was admitted on Friday with an infection in his foot. He’s doing much better. I pulled up to the valet stand where a young man dressed in a bright red jacket and matching cap stood ready to open my door. I said a little prayer that he’d agree to park my car because the hospital frequently restricts the valet services for those dropping off or picking up patients. I was tired and feeling sensitive and didn’t want to walk to the parking garage down the street. I just wanted to see my dad as quickly as possible. The valet opened my door. No, I replied, just visiting. “How long do you plan to stay?” he inquired. A few hours, I answered, I’m here to see my father. I stood for a moment, staring into his eyes, then thanked him for his kindness. I grabbed my bags and restrained myself from planting a kiss on his cheek. After my visit, I returned to pick up my car. I paid the parking fee inside the hospital and stepped out to the curb to wait for someone to bring my car around. The same attendant was standing at the valet station across the driveway and when our eyes met, he waved me over. “You don’t have to wait,” he explained as I approached, “I kept your car here.” He pointed to my SUV parked right near the exit, only fifty feet away. What a love, I said, as I handed him a gratuity and thanked him for being so thoughtful. You’ve made my day. I remembered this man, too. The last time I arrived at the hospital to see my dad after he was admitted with heart issues, I was upset and the valet knew it. He was gentle and kind and took my car during a very busy time when he probably should have sent me to the garage. We’re in this together and I’ll take care of you. Once again, I sat in my car for a few minutes before starting the engine, feeling grateful to receive his sweet generosity. At a time when there seems to be too many mean-spirited Facebook arguments about the presidential election and sensational news stories designed to pit us against them, it felt good to see the better side of humanity. 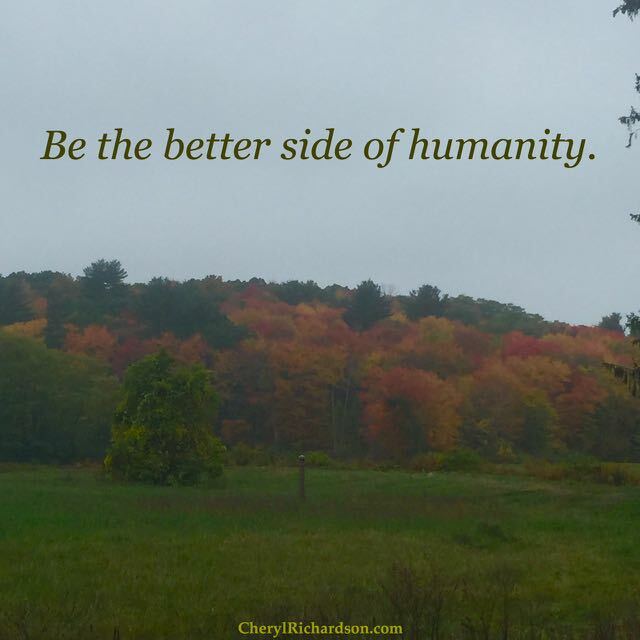 I drove away from the hospital with one thought in mind: Be that better side. Watching acts of kindness is good for the body, mind, and spirit. Feel good by spending a few minutes, here .